At 2863 metres, Triglav is the highest mountain in the Julian Alps (northeast Italy to Slovenia). Attempts to climb the summit normally require two days. While the mountain itself is quite barren and rocky, it sits in the middle of Slovenia’s only national park, with the same name as the mountain. Reaching base camp takes about six hours of trekking through the forest. Much of the way is aided by via ferrata—or iron steps and cables attached to the side of the mountain. Slovenian tradition demands that those who have summited have their bums whipped by ceremonial birch branches! Toubkal, in the Atlas Mountains of southwestern Morocco, is the highest peak in North Africa, at 4167 metres. It can be climbed in two days, is accessible from Marrakech, and can be climbed year-round, although crampons and ice-axes are needed between November and May. At other times of year no special equipment is needed. As well as beautiful views, a highlight of climbing this peak is the Berber communities through which you’ll pass on the way. When skies are clear, the Sahara Desert can be seen in the distance from the summit. Mount Kinabalu and Kinabalu Park are a UNESCO World Heritage Site and protected area. 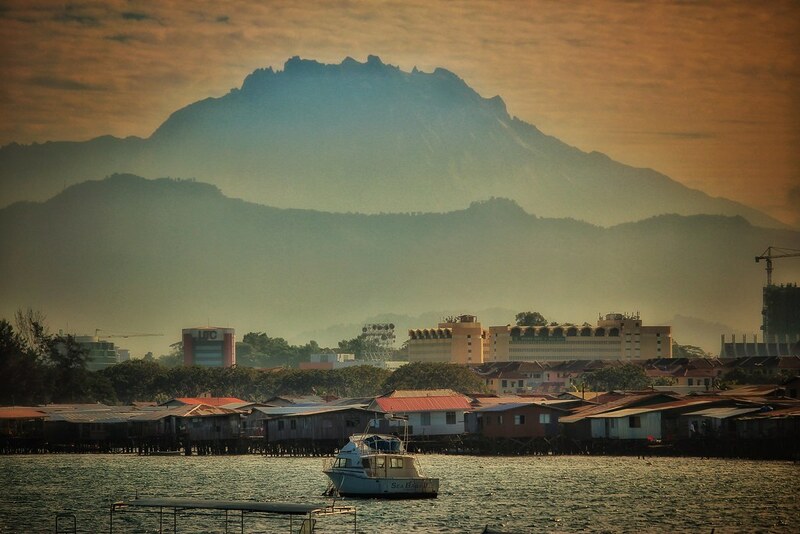 Kinabalu is the island of Borneo’s highest peak, at 4095 metres. It’s a particularly important mountain because of its biological diversity—it has more plant species than all of North America and Europe combined! Climbing it doesn’t require any particular equipment or skills, just good fitness. It’s a two-day climb that passes through many climatic zones, from steamy tropical jungle below to the cold rocky summit. On the Indonesian island of Lombok is Mount Rinjani, a 3726-metre volcano (and the second-highest volcano in the country). Although it’s often advertised as a trek, reaching the summit of Rinjani should be considered a climb, and only attempted by fit travellers with plenty of trekking experience. It takes two days, but the ascent is rapid, on steep and slippery trails. It’s a tough hike to the crater rim, but the view from there is incredible: turquoise Lake Segara Anak below, lush green valleys, and active volcano Mount Barujari on the edge of the lake. Nepal classifies certain peaks as ‘trekking peaks’, which means you don’t need an expensive expedition permit to tackle them. This doesn’t mean that they’re easy or should be taken lightly. Mera Peak is Nepal’s highest trekking peak, at 6476 metres, making it the highest accessible peak on this list (because even the hills in Nepal are higher than most mountains elsewhere!). It’s a good introduction to Himalayan climbing as it requires some mountaineering experience and equipment but is not too technical. Reaching the summit of Mera Peak isn’t the only highlight of a trip here, as the mountain is located up a remote valley in the Everest region. Mount Fansipan in Vietnam is often called the ‘roof of Indochina’, as it’s the highest in the region, at 3143 metres. As Mount Fansipan is located in the far north of Vietnam, many travellers reach it by taking an overnight train from Hanoi. There is an easy way to summit this mountain—take the cable car—but we don’t think you’re reading this article because you want to take the easy way. The climb takes two to three days, or you can walk one way and take the cable car the other. It can be a wet and slippery climb. The trip passes through interesting ethnic minority villages, and there are opportunities to spot monkeys, birds, and goats. No technical skills or special equipment is required. Mount Musala, at 2925 metres is the highest peak on the Balkan Peninsula and is easily accessible from Sofia. It’s located within the Rila National Park, which is rich in biodiversity. The summit can be reached in a day if you take the cable car, which cuts off 10 kilometres of uphill climb but still leaves you with several hours of climbing. The long route takes around two days. The ascent starts gently but gets steep quickly, and there are lakes, forests, meadows, rocky peaks and panoramic views to admire along the way. Snow can be found in the middle of summer, adding to the challenge. Mount Fuji has been a pilgrimage site for centuries. The practically symmetrical, snow-capped 3776-metre volcano is an iconic sight of Japan. It’s a very popular mountain among Japanese travellers so you’ll never have it to yourself; there are even vending machines at the top. The way is challenging as it’s covered in slippery scree, which is especially difficult on the descent. But the views from the top are phenomenal and reach all the way to Tokyo on a clear day. The climbing season is quite short, lasting from July to September, however, it is still possible to climb offseason from the end of September through October. Most people climb it in a single day by starting early, but a longer route through the thick woods at the bottom of the mountain can be taken, with the benefit of far fewer other travellers. Mount Damavand in Iran is the highest volcano in Asia, at 5610 metres, located in the Alborz range. Although Damavand is a dormant volcano, it is potentially active, and there are warm mineral springs at its base. It’s a popular climb with Iranian travellers. The actual climb from base camp to the summit takes a day (seven hours up, five down) and involves some pretty technical sections, so is best attempted by experienced trekkers and climbers. The final push to the summit is covered in snow, so can be particularly challenging. Due to its altitude, expeditions to climb Damavand should factor in a few days for acclimatising, these can be used to explore the ice-blue frozen waterfall of Abshar Yakhi (5100m), a 6-hour trek from the Bargah Savom stone refuge (4220m). Africa’s highest mountain, Mount Kilimanjaro in Tanzania is 5895 metres high. It’s not part of a mountain chain, and the dormant volcano (which is actually comprised of three volcanic cones) stands alone on the plains bordering Kenya. Although climbing Kilimanjaro is popular, it is actually a pretty challenging climb, and it’s estimated that only 75% of climbers reach the summit. The trip takes five days and must be done with a guide with a variety of route options available. Many people combine a Kilimanjaro climb with an animal-spotting safari in East Africa, and this certainly makes for a memorable trip. Feeling inspired? Explore our hand-crafted hiking and trekking trips and other epic adventures.